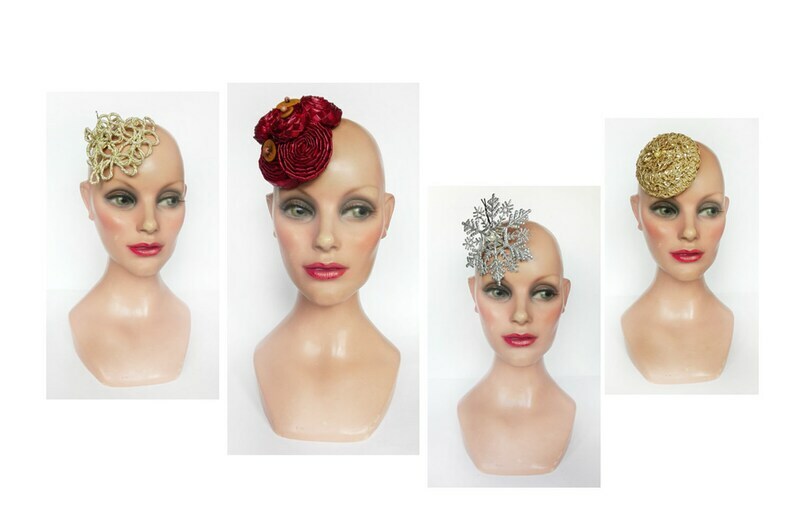 Fascinator for a bride in gold, for a wedding fascinator in red, ceremony, pillbox hat party hat. Small fascinators boho glamour can be worn on many occasions... or as a gift for someone who is dear suggestion. The Red version: fascinator boho bibi ceremony, little pillbox made straw natural vintage beautiful red, associated with flat wooden beads. For version Gold: bibi minimalist with a diameter of 9 cm, made of braid vialaton gold presence with a bow, sequins and small pearls. An alligator clip to hold it well over the head. The silver version: bibi trendy silver glamorous bling bling made with a star-snowflake plastic covered with silver sequins, imitation Pearl bead and small silver cones. Its diameter is 11 cm and a black hair clip of 7 cm allows to fix in the hair. The yellow version: hat is made of yellow-gold intermingled cord. The diameter of the cuff is 9/11 cm and maintains a hair clip in hair. Trendy minimalist design, it is soft and so easily adapts to the hair.